We’ve often wondered what cats see when looking at colors? Can they discern all of the beautiful colors of a rainbow or the deep green color of the grass in which they play when romping about on the lawn? Or are colors to them merely a dull, greyish blur? Scientists have been researching this topic for a long time and the results are not only amazing but also rather colorful – a cat’s world is not merely black and white or greyish. The nerve cells in the eyes discern color and inside the retina there are two main cell types called rods and cones. Differentiating colors is determined by the color sensitive cells called “cones” and both human and feline eyes contain three cone types that can identify the three color combinations of red, blue, and green. The human eye has 10 times more cones than do cats so the human eye appreciates more color variations. Cats, however, don’t appear to be able to perceive the full color range like humans and some scientists believe cats see only blue and gray and other scientists theorize cats (like dogs) can also see yellow. Cats do have an edge over humans when it comes to “rods” which detect motion and light levels. Cats have way more rods than do humans and this gives them the edge with seeing and identifying moving objects in low light. The entire spectrum of color escapes the cats eyes but this doesn’t mean cats cannot perceive different colors. This merely means cats may not be able to see “true”” object colors. They’re also less sensitive to changes in brightness which results in them not having the ability to perceive color in the vibrant, rich tones humans appreciate. Differences in color perception is not the only visual difference in a cat’s vision when compared to human vision. 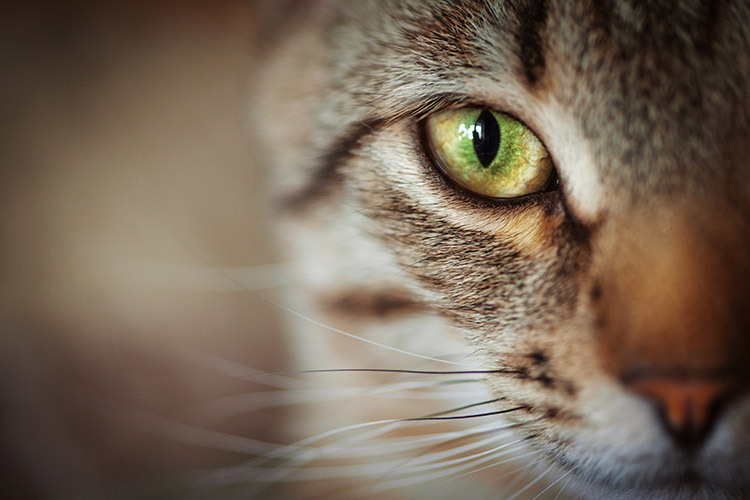 A feline’s vision is not as acute as a human’s and cats are also more nearsighted. What appears clear to us at a distance may appear blurred to a cat. At 100 feet we see a crisp image but to a cat the same image is blurry until the cat is about 29 feet away! To offset these deficiencies cats have other visual advantages humans do not have. Cats eyes are set more to the side of their head. This gives them better peripheral vision than us. But there is a trade-off – humans have better depth perception than do cats. Cats have elliptical pupils that dilate to the maximum and capture a lot of light. They also have the “tapetum” – reflective cells under the retina that give them their shiny eyes and also improve their dim light seeing capabilities at dusk and dawn. This also enables them to detect motion accurately. More rod cells in their retinas than us account for cats being able to detect small movements and any motion at great distances. Seeing well in dim light. Determining the slightest movements in dim light. Seeing great distances. All these things cats can add up to one thing – survival! Not only does a cat’s sight improve their hunting ability but it also aids a cat in knowing when he becomes the prey and needs to flee! It’s good practice to keep the color range of your cat in mind when you go shopping for your cats toys. Your cat will pick yellow and blue over the color red so yellow and blue toys should rule in your household if you own a cat. The common misconception is that cats can only see shades of grey and not any color. A cat’s vision is actually comparable to a human who is color blind. Cat’s see shades of blue and green but reds and pinks can be a bit dicey for them (as can hue richness and color saturation). VCA Hospitals: Do Cats See Color?